The picture of a Tree of Life has to be archetypal because from ancient times it appears in myths, legends and paintings from all around the world. It's very easy to visualise. And its origin as a geometrical symbol in Kabbalah is also veiled in mystery. It was developed around the 16th century in Spain by Kabbalists who wrote commentaries on the classics of the Sepher Yetzirah, the Sepher Ha-Bahir and the Zohar. The Tree of Life designed by the Ari (Isaac Luria) and his teacher Moses ben Cordovero only has one path connected to Malkhut, and two paths connecting Gevurah to Chokhmah and Chesed to Binah. The twenty-two Hebrew letters are arranged on the paths very neatly so that the three mother letters are on the three horizontal paths, the seven double letters occupy the seven verical paths and the twelve simple letters occupy the twelve diagonal paths. Moreover the ten sephirot are given titles and positioned in hierarchical order on the Tree. Later in the 18th century, Elijah ben Solomon Zalman – Gra – designed a Tree of Life which resembles a double cube to show paradise, the world before “The Fall”. It is also a visual aid to his own version of the Sepher Yetzirah. However, the most well known version of the Tree of Life is one that comes from a magical tradition which was first brought to light in 1652 by the scholar Athanasius Kircher when he published his “Oedipus Aegyptiacus”. This version is said to be part of a long uninterrupted Western tradition, often called Hermetic Qabalah, that originated in classical Greece and which some claim was adopted later by the Jewish Kabbalists. In the Sepher Yetzirah, where we first learn of the ten Sephirot and the twenty-two paths, there are no diagrams. I believe that all these different arrangements of the ten sephirot and the twenty-two paths on the Tree of Life have merit in their own right as methods to examine scriptures, to train the mind to contemplate, to enable us to question and examine who we are in an objective maner. Abstract diagrams serve as creative blueprints of the world we live in. The origins of the Sepher Yetzirah are unknown, it is believed by some to have been written as early as 100BCE but the text is quoted as late as the 6th century CE. There are four important versions of the classic, the shortest being 1300 words and the longest 2500 words. The ten Sephirot are described in terms of five polarities: Beginning and End, Good and Evil, Height and Depth, East and West, North and South. Later Kabbalists in their writings gave titles to the sephirot and tried to associate these five polarities with moral qualities in line with the teachings of the Zohar, a multi volumed commentary on the Old Testament, which appeared in Spain in the late 12th century and which is said to have been written by the Kabbalist Moses de Leon. The sephirot and the twenty-two are miraculous, in the sense that they are both not of this world and yet part of it as well. 1) Keter, The Crown, 2) Chokhmah,Wisdom, 3) Binah, Understanding, 4) Chesed (or Gedulah), Mercy, Love, Righteousness 5) Gevurah (or Geburah or Din or Pachad ), fear, Judgement, Power, Might, Severity 6) Tipheret, Beauty, Peace, Truth 7) Netzah, Victory, Beauty Triumphant, Eternity, 8) Hod, Splendour, Glory, Reverberation- 9) Yesod, Foundation 10) Malkhut, the Kingdom, The Presence. Since the 12th century, with the cross-fertilisation of sciences and philosophies from all corners of the world, more and more associations have accrued around the ten Sephirot and the twenty-two paths. The hierarchical structure of Tree of Life is excellent in revealing how the underlying principles in any system are interconnected, how energy in processes can be stepped up or down the student is encouraged though meditation on the symbol to build an inner vehicle founded on sound moral precepts. Here are two different logical methods for associating the twenty-two paths and letters to the ten Sephirot. “Galgal the Master Game” Published in 1972 by Scot O' The Covert, London and again republished by Friedman/Fairfax as “The Tree of Life Oracle” in 2002, by Gila Zur and Cherry Gilchrist. “Galgal” means Wheel or whirlwind. The Galgal method proposes that as the“the lightning flash” rushes forth from Keter to Malkhut, the twenty-two paths are created in the order of its passing. For the Tree to be complete at every stage, as each new sephirah is touched by the lightning flash, all paths to it from the previous sephirot are also completed in hierarchical order. Every time a new path is created it is assigned a new letter in the traditional order of letters in the Hebrew alphabet, and this journey continues until all 22 letters have made their appearance. Begining at Keter the lightning flash carries the Logos to Chokhmah and the1st path is completed, Aleph (Multiply). It then continues from Chokhmah to Binah, forming the 2nd path and 2nd letter, Beth (House). At Binah the 3rd path from Binah to Keter is completed and so is the 3rd letter, Gimel (Complete). The lightning flash from Binah continues its journey across the abyss and Da'at to Chesed, at which point the 4th path between Chokhmah and Chesed is formed, as is the 4th letter, Dalet (Depend). It continues from Chesed to Gevurah forming the 5th path and the 5th letter, Heh (Being). As soon as Gevurah is touched the 6th path between Binah and Geveurah is formed, and the 6th letter, Vav (Secure). From Geverah to Tiphereth the 7th path and 7th letter, Zayin (Listen) is formed. As soon as Tipheret is touched the paths to the previous sephirot are also formed in hierarchical order: The 8th path from Keter to Tipheret is filled by the 8th letter, Het (Fear), the 9th path from Chokhmah to Tipheret carries the 9th letter, Tet (Draft), and the 10th path from Binah to Tipheret contains the 10th letter, Yod (Direct). The 11th path is completed between Chesed and Tipheret, and the 11th letter, Kaf (Incline) is born. The lightning flash continues fromTiphert to Netzach forming the 12th path and 12th letter, Lamed (Learn). As Netzach is touched the 13th path between Chesed and Nezach is completed, the 13th letter, Mem (Flow). The lightning flash moves from Netzach to Hod creating the 14 path and 14th letter, Nun (Growth & Decay). As soon as Hod is touched the 15th path from Gevurah to Hod is completed and the 15th letter is assigned to it, Samech (Support). Also the 16th path from Tipheret to Hod is assigned to the 16th letter letter, Ayin (Study). The lightning flash continues from Hod to Yesod forming the 17th path and the 17th letter, Peh (Name). As Yesod is awoken the 18th path from Tipheret to Yesod is completed, the 18th letter Tsadi (Integrity). Also the 19th path from Netzach to Yesod is completed as is the 19th letter, Qoph (Reproduce). Finally the lighting flash touches down on Malkhut the last sephirah, and the 20th path and 20th letter, Resh (Initiate) is born. The Path from Nezach to Makhut completes the 21st path and 21st letter, Shin (Repeat), and the last 22nd path and 22nd letter, Tav (Impress) are completed from Hod to Malkhut. The creators of Galgal also associated the Tarot cards to the twenty-two paths and their system was subsequently published in Zev ben Shimon Halevi's “Tree of Life”. They follow the traditional numbering of the Marseille Tarot until the 16th path, when on the 17th path they insert the 0 card of the Fool. Then the sequence of the last five cards continues in the normal order. The names on the cards are slightly different from the ones given in Marseille packs, and are shown here together with the paths that they occupy. This method of associating the twenty-two letters and paths is described by Donald Tyson's in his Millenium Magic in the chapter “Twenty-two Doors”. The logic is that one proceeds from the higher to the lower sephirah from the highest to the lowest angle whilst moving from right to left. The first 10 paths represent the sephirot and so the paths are numbered from the 11th to the 32nd . Starting at Keter, the 11th path is from Keter to Chokhmah, the 12th path is from Keter to Binah, the 13th path is from Keter to Tipheret. Having finished all the paths from Keter we start at the next sephirah, Chokhmah. The 14th path is from Chokhmah to Binah, the 15th is to the sephirah with the next highest angle, Tipheret, and the 16th path is to Chesed. The emanations move to the next sephirah Binah. The 17th path is the one with the highest angle from Binah to Tiphereth, and the 18th is to Gevurah. 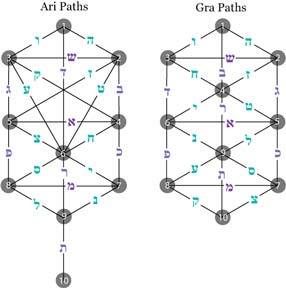 From Chesed the 19th path is to Gevurah, the 20th is the diagonal path to Tiphereth and the 21st path is to Netzach. From Gevurah the highest angle is the diagonal 22nd path to Tiphereth and the 23th path is vertically down to Hod. The emanations continue to the next Sephirah which is Netzach. The 27h path with the highest angle is from Netzach to Hod, the 28th path is to Yesod and the 29th path is to Malkhut. From Hod the 30th path is to Yesod and the 31st path is to Malkhut. Finally the 32nd path is from Yesod to Malkhut. Despite its flaw this is probably the most accepted and used system today. I have been describing the various meaningful associations created by various occult traditions over the centuries. It can all be very confusing to the ordinary mind. However, this is not a real problem at all if one retreats to the real Mind within. That I believe is just one of the aims of contemplating symbols. To awaken within us a hidden reality that is all encompassing, a place from where all paradox is resolved. So it is possible afterall to lift oneself up by ones own bootstraps.